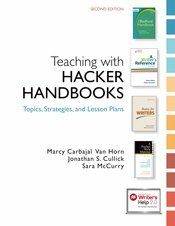 Teaching with Hacker Handbooks, a collection of resources to accompany all Hacker handbooks, helps you answer the question How can I integrate a handbook into my course? Both novice and seasoned teachers who assign writing will benefit from the practical strategies and materials developed by master teachers and others in the field. And if you supervise or train new teachers, you’ll find the collection helps you provide a mentoring experience. "This book came to me long after I began my teaching career, but it contains much of the information I learned in bits and pieces, through trial and error, and from speaking in the hallways with senior faculty between classes or at professional development activities."